Dental implants are one of the best ways to replace any teeth you are missing. They work by using a titanium post that is inserted into your jawbone. Eventually, that post will support a replacement teeth. Most often, the patient would have to wait at least a few months before the post has fully integrated to the jawbone before it is loaded with a crown, bridge or denture. However, for people who don’t want to wait, immediate loading is becoming more common. This is when the implants and the temporary teeth are inserted during the same procedure stage to save time and money. Everything is left as is for the healing period. At the end of that process, the temporary teeth are then replaced with your permanent crowns. What is meant by the Term ‘Immediate Loading’? What do one day dental implants cost ? “Immediate loading” is a bit of a confusing term for some. It means that the temporary crown is actually attached to your dental implant (the post) right after it is inserted into the jawbone. The replacement tooth is shaped so that it doesn’t cause any problems with the opposite tooth. This process is mainly intended for cosmetic purposes. However, the immediate load implants (also called same day implants or one day implants) can function as normal teeth, meaning that they can be used for eating. These are referred to as “immediate functionally loaded” implants and are typically used when you have several teeth in a row that need replacement. They are joined by a rigid connection like a denture. Sometimes these will be called “all-on-4” dentures – or dentures that are locked together and held rigidly until the jawbone heals. These help because they distribute any forces that may come into contact with the teeth. While it might sound like the best idea for your implants, know that patients will get natural looking teeth no matter what with implants. The real question is whether to immediately load the implants or wait following the traditional 2-step procedure. It is worth it to weigh the benefits and risks of getting your teeth immediately loaded instead of the traditional method. It really isn’t a technique for every mouth, but it has been around a while (since the 60s), and modern imaging technology has made it even more sucessful by anticipating any contraindication and finding the exact spots in you jaw to place the implants for best results. CT scans Actually allow dentists and oral surgeons to see exactly where they need to place the implants for optimum results. They will use torque wrenches to measure how much torque they need to put on the plants to get them in safely. This makes it easier for the dentist to place the implants under ideal conditions, i.e. healthy bone. The healing process is critical for the success of your implants because something occurs called Osseointegration. Osseointegration is when the new bone tissue in the jaw grows around the posts so that everything is held firmly in place. Recent studies have shown that implants shouldn’t be disturbed during the healing process because even a few little movements could mean the failure of your implant. Part of what the dentist will have to do during one-day procedures is make sure that the implants that are placed together are correctly positioned so that any force or biting won’t knock anything askew. Yet, studies done on various patients have also shown that while preventing movement is one of the most critical parts of the healing process, loading or putting some force is also important as well. This promotes the growth and strength of the new bone around the implant. However, it is an extremely strict process that must be monitored carefully. I know it can be confusing but remember that many factors do influence the outcome. These studies simply indicate that implants should not be disturbed during this healing phase, (avoid violent or strong pressure force) but gentle and light forces can promote bone growth. Remember that it will also largely depend on the density of your bone. The mode dense, the more your chances to get one day implants. Dental implant surgery is planned from top to bottom, so it is important that you go to all of your schedule appointments and consultations. They will need to learn about your complete dental and medical history. They will do all sorts of tests, including photographs, x-rays, and even CT scans. Using these tests, they will be able to determine things like bone density and implant placement without having to make rash decisions on the day of surgery. Looking at your bone density is one of the priorities of these tests, because your dentist needs to make sure that your implant posts are supported and everything looks natural. If you don’t have enough bone density, it can be built up with a bone graft before you have the surgery done. You might also have gum tissue issues around your implant and crown which can affect the way it looks. Those can also be grafted by your dentist as well from another site in your mouth. In the end, everything is up to your dentist and what will make the best look and feel for you. Once your dentist has all of the information that he needs, he or she can start to plan out surgery. Your dental professional will likely make a guide to know extacly where to insert the implants so that everything is precise. The guide that we just mentioned is made of acrylic and it helps the surgeon determine just where to put the implants and what angle they should be. 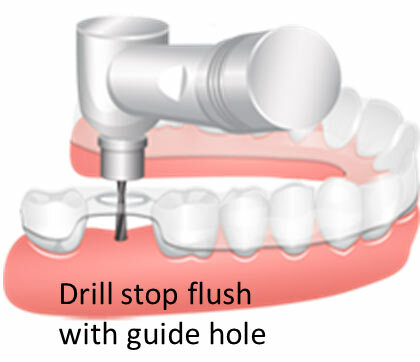 Using the guide, your surgeon will put the implant post directly into your jawbone. During the actual surgery, the post is inserted quickly and can be done under local anesthetic. If you need several implants or you are nervous, you can request extra sedation. Right after the post is inserted, the replacement tooth (also called healing cap) is attached to the post. This tooth is temporary and will be replaced by your permanent crown once the implant is fully integrated. A quicker procedure: As your teeth, especially front teeth, can be replaced almost immediately, you will have a reduced treatment time. With traditional implants, you would be left with a pretty ungly gap for months. Many people who need faster results will opt for same day implants. Only one surgery: For people who have a problem with surgeries or get nervous, this might be key. The implant, abutment, and temporary crown are all placed during one procedure, so your treatment time is reduced. There is no need for another surgery a few months down the line as for the tradditional method. The only next step will be the replacement of the temporary cap by your permanent tooth. Aesthetic appeal for Gums: with this method, your gum tissues will more quickly grow to fit the crown as you won’t need to cut it again and wait for gum healing – this will lead to a better aesthetic value quickly. 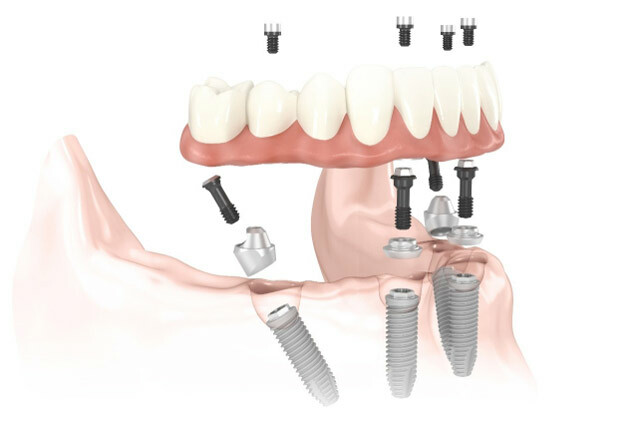 Self-confidence: Immediately loaded implants reduce the impact of losing teeth both on your mouth and your mind, because there is no need to wear temporary prosthetics or dentures to hide any gap. You can smile from the get go. Failure: A dental implant is called a failure if it doesn’t osseointegrate to your jaw or you suffer some sort of reaction. The quickest way to have failure is to have movement during your same day dental implants. Your surgeon will take all available steps to make sure this doesn’t happen, but it still is a possibility. Not for everyone: Same day implants will not work for everyone. You will need to have a strong jawbone that can withstand 35 Ncm of torque. This technique is suited to replace any front teeth, and any lower jaw teeth because for these teeth, the bone is strong and dense enough to support the implants. But it is not the case for the back teeth in the upper jaw as the bone is usually not dense enough. One of the most important things you need to do is keep your oral hygiene at its best levels before and after you get surgery. This means brushing, flossing, and using mouthwash. Your dentist may provide you with medicated mouthwash or toothpaste. You want to do this because any built up gunk or bacteria can cause the implant to fail. If you think you are going to have a problem maintaining excellent oral hygiene, then you may want to consider the more traditional implants that use two stages. You will get one surgery for the implant to be inserted into the jawbone, that you will let heal for a few months, being covered and protected by gum tissue and then another surgery so that you cut the gum to uncover the implant and get the abutment and crown on top. It is still critical for great oral health here, but you can get away with just a little less. Other alternatives that have a short turnaround time but are more affordable include partial dentures and/or fixed bridges. The ideal candidate for surgery is someone who had good dental and general health up to the surgery. If you smoke, you are automatically out of potential candidates, as it can affect your body’s ability to heal. That means you will be required to stop smoking. You will also not pass the screening if you are on high doses of bisphosphonate drugs because they increase the risk of bone death and might affect the ossoeintegration phase. For people with osteoporosis, with low doses of bisphosphonates, the situation is different and they can usually have implants. However, your situation may be different, depending on your dentist and your dosage. So you will need to talk to your dentist about your case. If you grind your teeth (bruxism) you might also want to look at other options as well. Bruxism puts a lot of stress on your implants and crowns, which can make them fail. Finally, those who get the surgery must be dedicated to their oral health. If you don’t, tissues around the implant could be infected and you could get a complication called peri-implantitis which is very similar to gum disease. Once your implant is in place, your body will start to grow new bone cells around the implant so that it bonds to your jawbone and everything is held in place. While it was previously thought that putting in the crown on top during this period would have negative effects, that isn’t the case anymore. Research shows that the initial stability of the post is what is really important in determining whether the surgery will be a success or a failure. Some of the important things there are the density of the bone, the force applied to place it, and the number of implants that you are getting and which are splinted together to dilute the pressure and chewing forces. This means that there really isn’t a difference in success rates between same day implants or the ones that make you wait. You get the same 95%-98% success rates. That means that immediate loading is usually proposed when you get many teeth to be replaced. However, single implants do need to be given a period of no load to minimize micro movements – which is why most dentists keep immediate loading for single implants for the front teeth as the temporary crown is easier to keep out of contact with other teeth while you heal. The cost of these types of implants are pretty much the same as the regular implants as it requires even more precise planning and imaging services to make sure the patient is a good candidate for this dental procedure. Yet, we noticed that because you only need one surgery instead of 2, the overal cost was a bit lower. To give you a rough estimate, you should apply a 10-20% discount on the prices for regular implants. As a reminder, check the complete list of prices in our guide here. Of course, keep in mind the cost is influenced by many factors indicated in our cost guide. One day dental implants are useful for some people, but they should be used with caution. You will need to be carefully evaluated and tested to make sure that it will work. You should also ensure that you choose a quality dentist who will help your process along. Reduce the risk of anything going wrong by keeping on top of your oral hygiene and reducing the risk of micro-movements. If you can’t get immediate load dental implants, tradditional Implants are still worth the wait if you can’t do them the same day. Patience is sometimes a virtue.